The designer’s contemporary redesign of the kitchen is less a midcentury move than an elegant response to a confined space. The kitchen is a simple, modern, tactile marvel, with metal-trimmed leather upper cabinets and backsplash tiles of textured antique mirror. The range is the only visible appliance in the kitchen; all others are disguised behind the cabinetry. A colorful lineup of cookbooks stands as a design element in the kitchen. The kitchen is “all about the river views,” says architect Jim Estes, with big windows and a minimal interior palette that features custom painted cabinets, Caesarstone countertops, and open shelving of white marble. 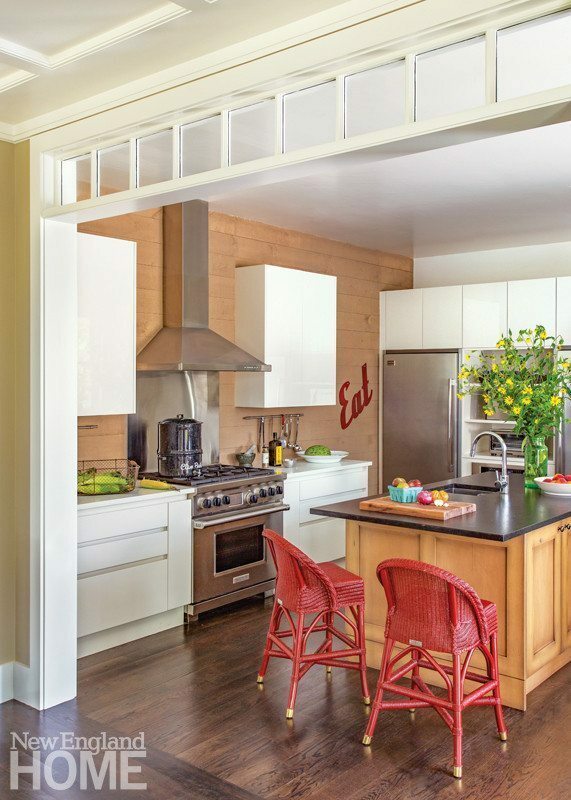 The kitchen features vinyl-covered bar chairs for worry-free eating. The brass fittings of the custom range hood are matched by similar accents in the pendant lights. Backless counter stools slide in unobtrusively beneath the island overhang when not in use. A backsplash and countertops of statuary marble marry gray and white tones in the new kitchen; the breakfast area’s chairs, swamped in the flood, were restored and repainted. Acrylic chairs circle the breakfast table in the kitchen. The kitchen’s mix of old and new cabinetry was united with leather pulls. “One of our goals was to provide plenty of storage,” says Duffy of the new kitchen, which has gone thoroughly modern with Leucos pendants and quartz counters. Reconfiguring the kitchen and opening it to the den was one of the first updates Coughlin made to the home’s interior. A banquette protrudes from the renovated kitchen, turning part of the circulation spine into a breakfast area. Form never surrenders to function, even in the kitchen, where the gray tile backsplash is matched by a custom-built island finished in a high-gloss lacquer. The kitchen was brightened considerably and given modern touches like the leather-finished marble countertops and a zinc backsplash. The newly remodeled kitchen includes a sunny area for casual dining. Jared channels culinary idol Thomas Keller in the kitchen, where graphic cement tiles cover the walls. To ensure the kitchen counters stay clear, Irving devised a bonanza of storage. Wood-grained Eggersmann cabinetry hides major appliances and provides contrast to the monumental marble kitchen island. A variety of textures is at play in the wet bar, where a mix of tile, marble, and polished wood brings warmth to the ultra-modern design. Stone, stainless steel, and crystal blend beautifully in the small but efficient kitchen. The kitchen’s support beams and frieze are reminders of the room’s modest beginnings. The marble surfaces, glazed backsplash, and metal finishes were the shot of glamour that was missing. A stainless-steel and galvanized metal island defines the kitchen. Although the home is filled with wood, the design team varied finishes and species to prevent the interior from looking, as the owner says, “too much like a log cabin or overbearing.” Custom-crafted lighting fixtures and a specially designed range hood give the kitchen and dining space a feeling of elegance and artisanship. A trio of Arteriors Reeves pendants dangles above the quartzite-topped kitchen island. The kitchen, a study in black and white, is a classic gathering place for family and friends. A custom table/island that works for both food prep and casual gathering is surrounded by two kinds of counter stools and illuminated by industrial-chic hanging lamps. Timeless, yet contemporary, the pristine white kitchen sports silvery gray accents in the Caesartone counters, stainless-steel appliances, and a knockout polished-nickel light fixture above the island. The kitchen continues the beach tones in the rich blues of the granite countertops and the back-painted, glass-tiled backsplash. French doors in the kitchen’s sitting area (once a porch) open to the garden. The cheery cushions on the rattan furnishings and woven Serena & Lily counter stools are in keeping with the stunning color of the La Cornue range. Spring-fastened stools at the kitchen island allow diners to bob gently, evoking the feeling of the waves beyond these walls. The kitchen is rich with texture, including smooth Calacatta marble countertops, an imposing bronze range hood, and heavily checked hemlock ceiling beams. The kitchen was truly in move-in condition; the only additions were the pots and pans and a pair of Holly Hunt crescent stools. Casual barstools in the kitchen offer an informal contrast to the dining room. Morgan Harrison gave the kitchen some pop with a globe light fixture from Remains, fresh window treatments, and new hardware. The kitchen is defined by straight lines and sleek surfaces: glass backsplash, countertops, and upper cabinets; stainless steel walls; and a quartzite dining counter. A border of reclaimed wood along the base of the vent hood ties in with the kitchen’s new beams. The chandelier came from the owners’ previous home. Yellow River granite gives the streamlined kitchen a rich feel. Serena & Lily bar stools surround a marble-topped kitchen island; the owners acquired the vintage, orange-lacquered lunch box on a trip to Myanmar. Appliances are concealed within a wooden enclosure designed to resemble an old ice box; like much of the interior millwork, it was built by Michael Smith. The kitchen and adjacent dining area feature a combination of open shelving and custom cabinets. The kitchen’s tapering metal island is inspired by midcentury iconography and fabricated by metal artisan Bartek Konieczny. Konieczny also crafted the island’s movable light fixture. A fresh finish was all the perimeter cabinets needed. The island, however, was enlarged and reborn in the image of a European range. Hidden appliances and the absence of cabinets around the range keep the kitchen uncluttered and in thematic harmony with the clean lines in the rest of the home. The kitchen’s marble surfaces sport a leathered finish, which translates to less maintenance. Architect Adolfo Perez designed the kitchen’s steel hood and the shelf beneath it to boost efficiency. Corian boxes—one a knife holder, the other a nest for oils and vinegars—support the latter. The kitchen opens to the light-filled dining room. An ever-growing collection of copper cookware brings Old World luster to the freshly painted kitchen. A zinc-topped wet bar features a well for liquor bottles and ample storage for barware. The kitchen features form and function in equal measure. Reclaimed vintage white oak rafters add a rustic touch to the cedar-clad great room. A boon to entertaining, the butler’s pantry is accessible to the kitchen and screen porch. “The kitchen was a labor of love,” says interior designer Liz Stiving-Nichols. The room’s wood ceiling links the space to the adjacent great room. 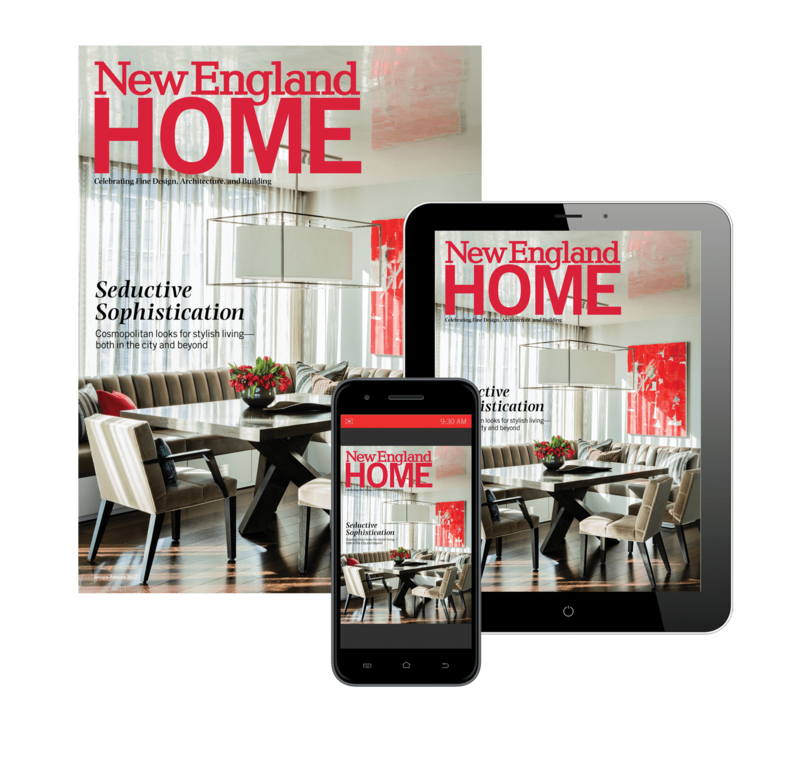 Kitchen designer Donna Venegas and interior designer Jennifer Palumbo collaborated on the kitchen, where subtle color gives classic elements a fresh look. The open kitchen features a Thermador Pro Series gas range and hood and granite countertops. The limestone on the floor is repeated on the kitchen’s island and backsplash, where it contrasts with stainless steel cabinets. The open kitchen is outfitted with custom cabinetry that sports authentic marine cleats for hardware. Silvery crackle ceramic subway tile adds shimmer to the backsplash. The owner wanted countertops of Caesarstone for its high style and low maintenance. Favreau had some fun in the kitchen, punching up the existing cabinets with blue electrician’s tape. 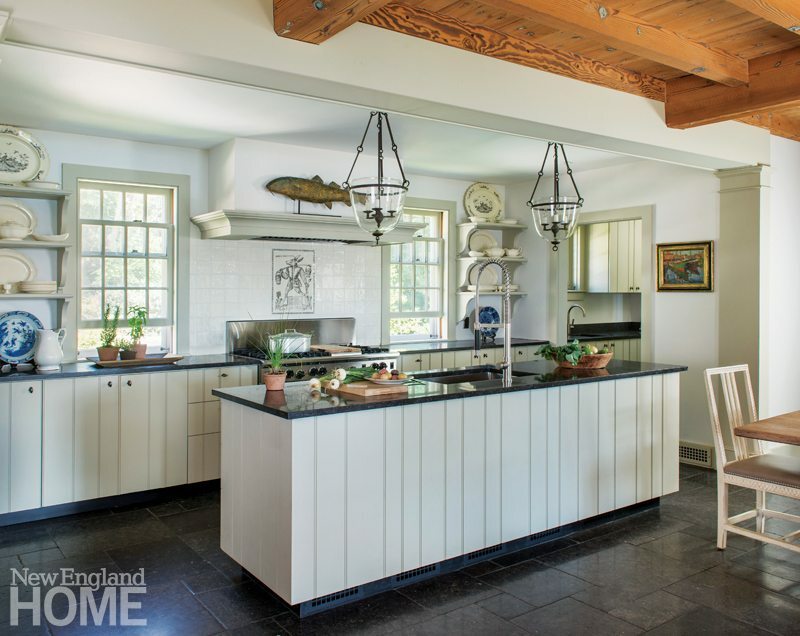 An antique fish weathervane decorates the kitchen’s custom hood. Reclaimed vintage barn beams and iron tie rods anchor the renovated kitchen that is now flooded with light, thanks to new, generously proportioned windows. After a flood destroyed her new kitchen, Burke worked with Farmington architect Jack Kemper to remake the space, raising the ceiling to twenty-two feet and installing distressed cabinets topped with quartzite. 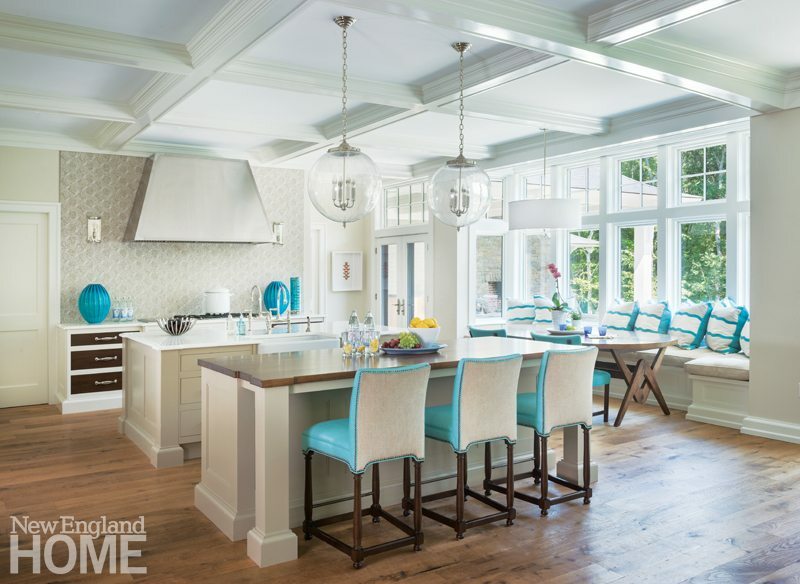 Glass star chandeliers illuminate the long kitchen island, which offers seating for informal meals. High ceilings give the kitchen an airy feel and make room for plenty of cabinetry. The heft of the marble-topped kitchen islands is offset by light gray cabinetry and the cheerful striped fabric on the barstools. The kitchen countertops went from granite to modern white quartzite. The clean-lined Bulthaup kichen works equally well whether the wife is indulging her own love of cooking or supervising the caterer at one of the couple’s frequent parties. A waterfall edge on the kitchen counter is an elegant touch, as are the glass tiles along the backsplash, but, equipped with a full range of hidden organizational features, the room is also functional. Stone and natural wood add age and character to the arched space containing the refrigerator and storage. Built-in shelves by Michael Humphries Woodworking provide storage and display space. Light from a bank of oversized glider windows washes the concrete counters and island top. Classic Shaker-style cabinets, honed black granite countertops, and a Moroccan-tile backsplash give the kitchen—a joint effort of De Bastiani and Judith Whalen of Roomscapes—its casual sophistication. The swirling grain in the Douglas fir, shown here in the service barn’s kitchen, is one of the key elements in Gleysteen’s design vocabulary. The bright new kitchen sits at the front of the house, but opens to the family room so that backyard views can be appreciated. Rylee and Fisher planned two generous entrances to link the kitchen and family room. The industrial-style lights above the island are from Restoration Hardware. The white backdrop makes the room feel “crisp,” Rylee says. The modern, streamlined kitchen was designed by architect Stacey Jacovini Storm during the initial renovation in 2007. Henry punched up the breakfast area with bright fabrics. Designer Joanna Seitz chose the dining room’s dimmable glass globe pendants to complement the industrial lighting used elsewhere, but disappear against the backdrop of windows. The custom-made table and stackable, recycled-rubber-slat chairs were among her other finds. Christopher Peacock Cabinetry of Boston joined forces with Marcuvitz and Arner to design the spacious kitchen and its light-filled breakfast area. Clear pendants by Remains cast a beam on the island without detracting from the architecture. A marine finish safeguards the island’s walnut top, where Hickory Chair stools line up. Ebony-stained oak floors create a bold contrast with the clean white-and-gray color scheme in the kitchen. The granite-topped island morphs from prep area with storage at one end to casual dining table at the other end. Along the scullery hall, the homeowner has a favorite niche that holds books and a comfortable place to read. 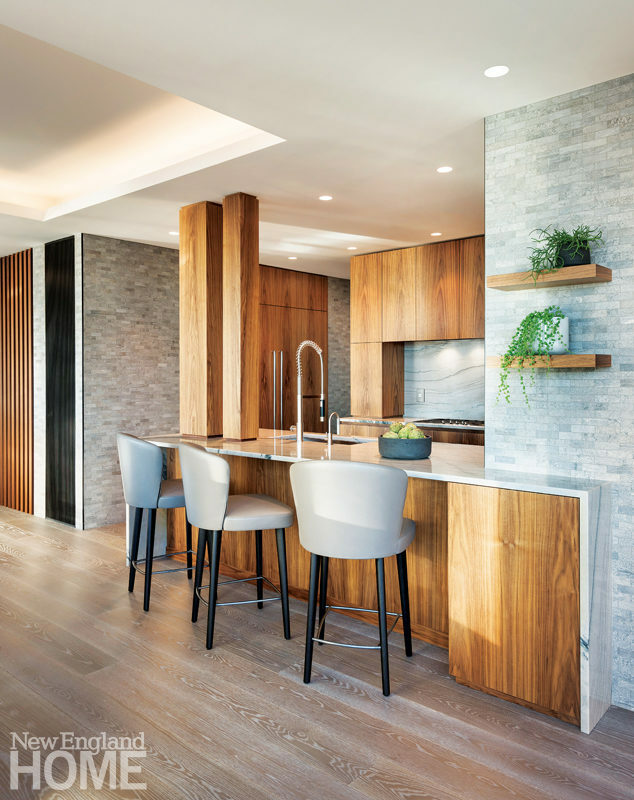 The kitchen is furnished with simple wood cabinetry and pale counters, with tapering stone columns that form a solid connection to the rest of the house. A seating area in the kitchen features an Eero Saarinen Tulip Table. Stools from Restoration Hardware line up at the kitchen island, which has a top of Pietra del Cardoso sandstone. Perkins mirrored the cabinet panels to reflect the views of the other side of the room. The kitchen has plenty of family-friendly seating options. The airy kitchen continues the understated Americana theme with its island and lanterns sporting a patriotic navy blue. Shapely Palacek stools in a zesty fabric add energy to the quiet blue-and-white palette of the kitchen. Translucent sliding panels mean the prep area can be closed off or opened to a view of the fireplace. Innovations such as a rolling kitchen island make wise use of space. Congenial swivel barstools belly up to an island topped with pale-blue quartzite. Wood beams and painted beadboard emphasize the vaulting of the kitchen ceiling; the design team took down walls, allowing the kitchen to flow into the breakfast area and living and dining rooms. The living room includes a well-equipped bar. The kitchen was the starting point for the home’s design. Granite-topped counters and a walnut-topped island provide plenty of working space in the kitchen. Narrow built-in drawers add a graphic note. Antique light fixtures illuminate the kitchen island. Bistro chairs custom made in France flank the Carrara marble kitchen island. The bright, spacious kitchen was designed with the homeowners’ frequent entertaining in mind. Sparkly pendant light fixtures from Lucía Lighting & Design add a fun touch to the open space. Steel and salvaged wood and soapstone come together beautifully in the open kitchen; reclaimed pumpkin pine forms the suspended shelves. The kitchen and dining room are perfect examples of an intentionally casual mix of materials and styles. Appliances hide behind the cerused finish of the cabinetry. The sleek, open kitchen has a modern aesthetic that doesn’t trump functionality. Having been previously renovated, the spacious kitchen primarily required cosmetic attention. Valances in a tailored Kravet fabric and sleek pendants by Visual Comfort give the space a fresh look. To accommodate his clients’ request for greater efficiency and comfort, Carter modified the island before flanking it with a parade of inviting Hickory Chair barstools. Glass-front custom-crafted cabinets enhance the open kitchen’s airy feel. The new kitchen is bright and efficient. The dining room’s Robert Abbey chandelier makes a striking contrast to the warm wood table. 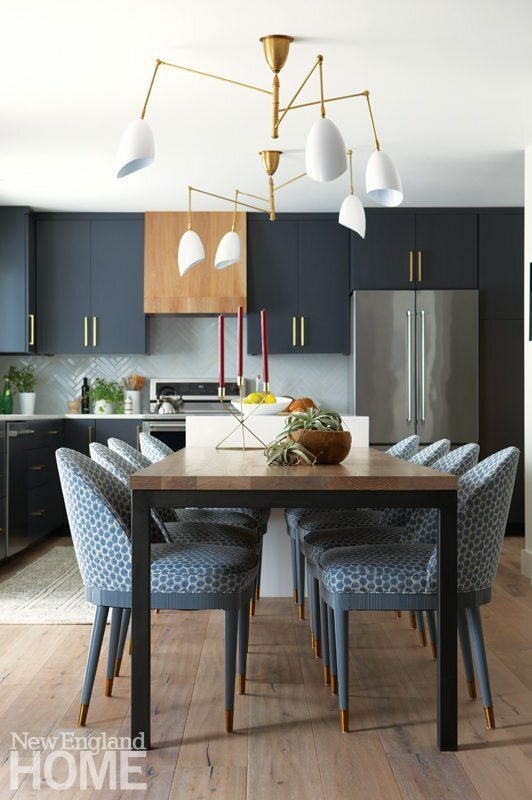 A colorful backsplash from Ann Sacks brightens the kitchen as do the brass pendant lights, with a black patinated exterior, by Tom Dixon. The Carrara- and Thassos-marble backsplash in a soft gray-and-white pattern lends a wow factor to the kitchen. The table in the eat-in kitchen juxtaposes a distressed antique wood column base with a sleek cast-iron top. A custom hood and island are commanding elements in the bright white kitchen. Two-inch-thick marble from Danby, Vermont tops the kitchen island. Colonial-style light fixtures and bar stools made way for a more modern interpretation. The vintage barstools were once used by Maine factory workers. Beams hold the racks for pots and pans. A brick fireplace makes the stone-floored kitchen a favorite gathering spot. The pantry window once graced an old English cottage. Holly Hunt stools belly up to the soapstone-topped island. The kitchen needed little more than new light fixtures to freshen it up. The kitchen is stylish but no-nonsense, perfect for this Â­serious cook who loves to entertain. A collection of windows surrounding the range hood pulls light from the mudroom into the kitchen. Hanging glass globe pendants above the island keep the space fully transparent. The angular coffered ceiling of the kitchen contrasts with the oval shape of the adjacent breakfast room. Chrome and yellow-vinyl barstools add sunny warmth to the modern kitchen, where skylights bring in natural light. Ralph Lauren Homeâs Sudan Weave wallpaper wraps the kitchen above Carrara marble countertops. Decorative painter Topher Carnes executed the graphic floor. Hanging lamps with high-gloss metal shades and frosted light diffusers keep things bright but also easy on the eye. The cement counters are enhanced with a band of stainless steel. Traditional cabinetry mixed with Italian lighting and a stainless steel backsplash meld California modern with classic New England in the kitchen. The kitchen, at the center of the cross-shaped floor plan, extends into the glass-walled breakfast room. Glossy white lacquer makes the kitchen all but disappear, allowing art and the occasional shot of color to pop. The kitchen features painted maple cabinets, a soapstone-topped island and a cherry valance hood over the stove. Rattan stools surround a large center island in the kitchen, which blends cottage-style wainscoting with botticino marble countertops and contemporary stainless steel appliances. Cherry kitchen cabinetry, a fir ceiling and windows and a bright rug under the dining room table banish all hints of glassy coldness. Marble countertops complement the three-dimensional kitchen tiles. A custom kitchen cabinet by Venegas and Company provides a display area for treasured pieces. Most of the kitchen is surrounded by windows; the one interior wall is tiled in glass. Architect Maryann Thompson cantilevered a soffit indoors and out to manage light in the dining area. Design Group Italia stools from Herman Miller belly up to a kitchen dining counter clad in bleached, glazed oak. A striking glass screen defines the kitchen. The kitchen cabinets were custom built on site by Dutch cabinetmakers. Vintage chairs by Milo Baughman upholstered in glazed linen from Holly Hunt surround a custom table by Martha Sturdy from Baker Furniture. The home’s gray and blue palette is enhanced in the kitchen with white Calacatta marble. White-on-white works in the kitchen with its smooth Calacatta marble counters. The kitchen, with its gray and white palette, was already in place when the Rosens moved in. The kitchen incorporates traditional and modern elements. The kitchen’s glossy surfaces reflect light. The kitchen, with its wall of Japanese ceramic tile, sits at the center of the unit and opens to the home office. Cabinets built by Woodmeister Master Builders were treated to a coat of shiny paint that resembles a metal surface. The house’s rich oak flooring is most evident in the open kitchen. Dark-green granite counters gave way to white Calacatta marble in the kitchen. Glick swapped out a country pine table for the contemporary dark-wood table and surrounded it with streamlined chairs in white leather. The recess in the kitchen pantry cabinetry was meant to display art, but the client’s need for entertaining space led to the last-minute purchase of swivel lounge chairs. An eye-catching "X" brings visual interest to the kitchen peninsula. Contemporary stools make an arresting juxtaposition with the old wood. Every inch is maximized in the kitchen, where the work triangle is small, but materials like the velvet quartzite countertops and glass mosaic backsplash loom large. A cluster of baubles hanging from the coffered ceiling and a console with scrollwork details elevate the dining room to what the homeowner calls the "most beautiful room in the house." Kitchen designer Nena Donovan Levine tailored the layout to the way the owners work in the space. The cabinets and marble-topped island, inspired by Welsh furniture, showcase the couple’s cobalt glass and copper pots. A field of porcelain tile edged and accented with stainless-steel strips stands in for a rug beneath the dining table.